After his DJ spun a few hip-hop classics, 18-year-old Bishop Nehru took the Adelaide Hall stage rocking a Tommy Hilfiger windbreaker. These sartorial and musical nods to the '90s situate Bishop Nehru among barely out of their teens peers like Joey Bada$$ and Toronto's Raz Fresco, expressing a yearning for an era that was in full bloom while they were in diapers. Bishop Nehru has obviously been a diligent student of lyrically intricate MCs of the era, and his upcoming album for Nas' Mass Appeal label is next on deck. 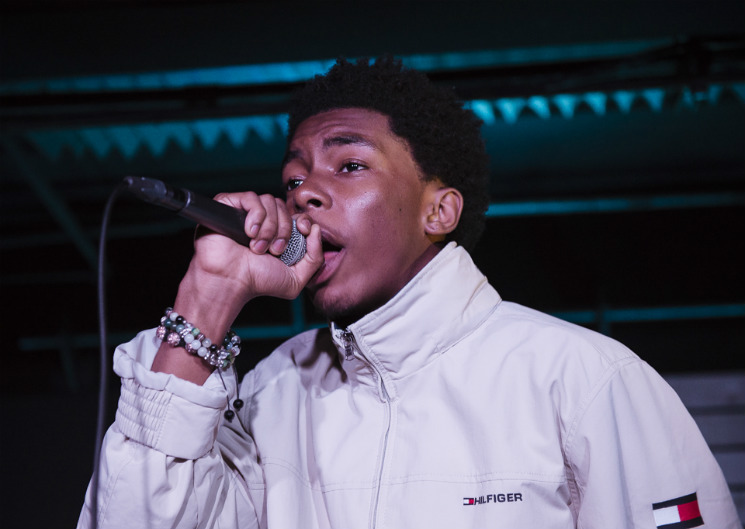 For now, Bishop Nehru was eager to get into his recently released Nehruvia: The Nehruvian EP, and dropped tracks like "User$" and "Darkness" from last year's NehruvianDOOM project with MF Doom as well as comparative throwback "77" to an appreciative crowd that wasn't as hyped as the MC wanted them to be. After asking the crowd if they were tired, he remedied any remaining indifference with his dope Disclosure collaboration, "You Stressin'," which got the desired and deserved hands-in-the-air reaction.